This was ordered by a US soldier in Baghdad, Iraq for his girlfriend. The Internet allows us to work with people all over the world. 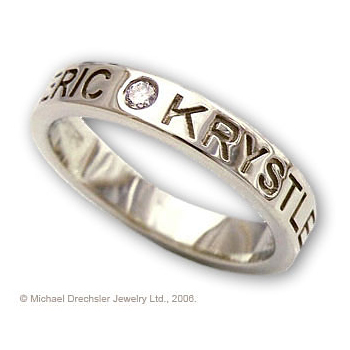 This 14 Karat white gold band features a .05 carat diamond and is engraved with the names of the couple. Get More Information below or Phone 877-717-7226.